Well, for now - with Timothy - that's the end of my Reagan/Ragan line. 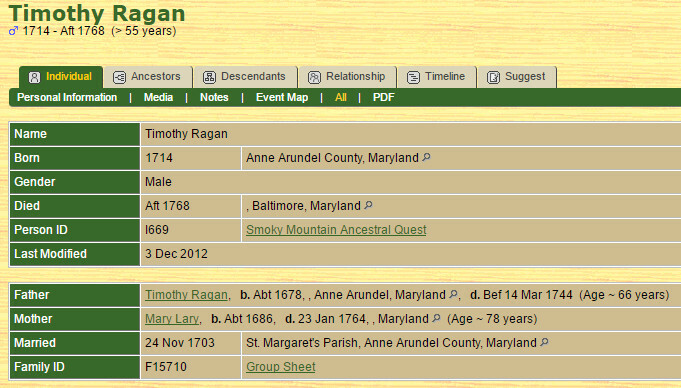 Most Ragan/Reagan researchers say Timothy Ragan Sr. was born around 1678 in Anne Arundel County, province of Maryland and died in the Elk Ridge Community in Anne Arundel before March 14, 1744, at the age of 55. Better men than I have tried to delve back farther, and it probably means a trip to Ireland for someone. Of course, if you are reading this and know the answer, please share.